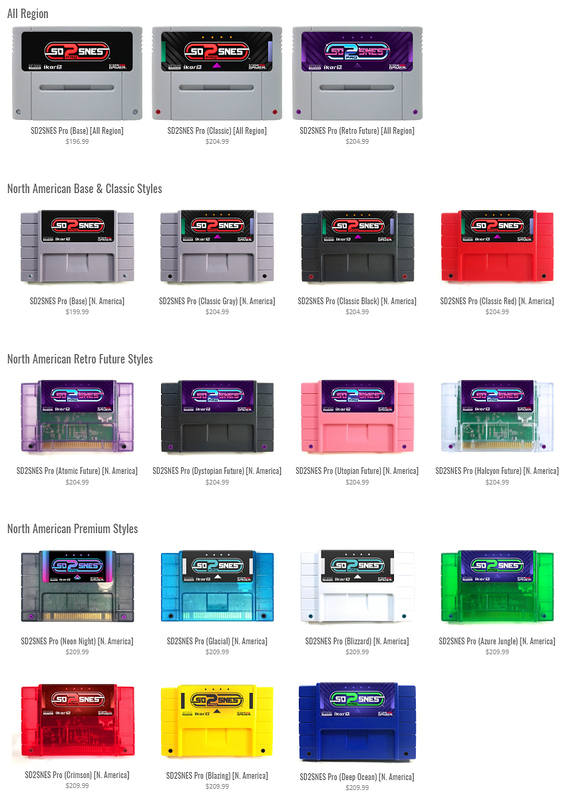 The SD2SNES Pro will be available for purchase Friday, April 5th, 2019 at 12:00PM (noon) Eastern Standard Time (GMT-5) at StoneAgeGamer.com. Though the SD2SNES Pro will be available for purchase, it will be pre-order only. We have sent everything off to print (labels, manuals, inserts, etc. ), but we can't begin shipping until the required items are received. We expect this to be within 2-3 weeks from April 5th. If the SD2SNES Pro is marked as "All Region," it will come in a Super Famicom / European SNES-type shell that will fit into systems from all regions. If the SD2SNES Pro is marked as "N. America," it will come in a North American-style SNES shell that will only fit into North American systems. The first batch of SD2SNES Pro PCBs will not fit North American-style shells. The second PCB production batch has been slightly altered to accommodate the North American style shell. WARNING: Do not purchase an All Region PCB with plans to eventually put it into a North American shell. If it's part of the first batch, it will not fit. As many of you know, we are offering customers the opportunity to trade-in their original SD2SNES towards the purchase of an SD2SNES Pro, or store credit which can be used anytime in the future towards any purchase. This trade-in program will be launching at the same time as the SD2SNES Pro. If you plan on taking advantage of this program, we highly recommend being prepared by knowing which PCB revision your original SD2SNES has. Instructions can be found in the information link above. Before purchasing, we encourage customers to understand the differences between the SD2SNES and SD2SNES Pro. As of today's date (4/3/19), the SD2SNES and SD2SNES Pro have similar functionality and compatibility. However, the SD2SNES Pro contains updated components. Most importantly, the FPGA in the Pro has upgraded to the Altera Cyclone IV, which has quite a bit more power than the original Spartan FPGA. This may allow future features such as better game compatibility, save states, Super Game Boy emulation, SuperFX overclocking, and more. That said, we strongly suggest only purchasing a product based on what it can do at the time of purchase and not what it may be able to do in the future. If you have any further questions about the SD2SNES Pro, please contact us at https://stoneagegamer.com/web-contact.html.